Financial access is growing rapidly in Madagascar: From 2014 to 2017, the percent of adults that had a financial account or used mobile money services doubled from 9 percent to 18 percent. However, it is below the 43 percent average for sub-Saharan Africa in 2017. A new edition of the World Bank’s Madagascar Economic Update highlights how financial access has increased in recent years and provides recommendations on expanding it further. Mobile money accounts have risen from 11 to 54 per 1,000 adults between 2013 and 2016. Similarly, the volume of lending in the microfinance sector has increased with total credit at 1.9 percent of GDP in 2016, having more than doubled since 2011 (Table 1). However, 41 percent of Malagasy households had no access to financial services in 2016. The lack of access is higher in rural areas where 46 percent had no access compared to 31 percent in urban areas (Figure 1). 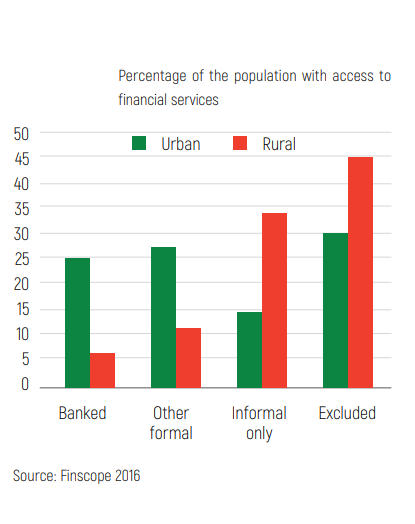 Similarly, only 7 percent of the population in rural areas had access to a bank compared to 25 percent in urban areas. The report provides recommendations for banks and microfinance institutions (MFI) on how they can expand access to financial services, particularly in rural areas. Recommendations for MFI’s include developing partnerships with mobile money operators and expanding digital services to reach rural populations where physical branches are not feasible. Banks can support financial inclusion by increasing credit services for medium and large enterprises, helping them grow and generate employment. New financial sector laws for e-money, microfinance, and credit bureaus passed by parliament in 2017 and 2018 will also support future efforts for financial inclusion. The credit bureau law, in particular, will reduce cumbersome collateral requirements for borrowers, helping more people access credit.